Poisonous plants can be harmful to our dogs. Unfortunately, our Spaniels won't know which plants are safe and which are toxic; there's no 'doggie radar' to warn them off. So it's down to us to understand which plants can harm our pets and protect them from accidental poisoning. You wouldn't want your puppy to eat anything that could harm him, would you? Of course you wouldn't, so here's a list of many toxic plants to help you keep your Cocker Spaniel safe. I couldn't find many poisonous plants beginning with 'K'! If you know of any, please drop me a line and let me know. I couldn't find any poisonous plants beginning with 'Q'! If you know of any, please drop me a line and let me know. I couldn't find many poisonous plants beginning with 'X'! Poisonous plants can contain many different types of toxins, resulting in different reactions and symptoms. and in limited but serious cases, death. The list of poisonous plants below isn't exhaustive, but it contains many common plants that could harm your Cocker. Take a look through and see if you have any in your yard, garden, or your home. Keep your Cocker Spaniel safe! The above list is not a definitive list of toxic plants, there are many, many more. The information provided is intended for use as guidance only. If you think your Cocker may have swallowed any part of a plant that you think is poisonous, whether or not it's listed above, please speak to your vet immediately. Time is of the essence! If you know the name of the plant, tell your vet, (or better still, take a sample of it with you when you visit) explain which part(s) of the plant have been eaten and let him know how your dog is reacting, ie, what are his symptoms. 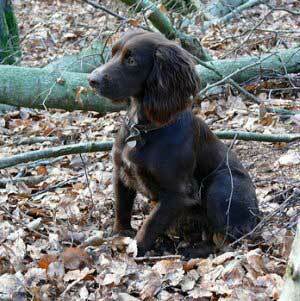 Your Spaniel may not have been poisoned, but may have an allergy or sensitivity to a particular plant. Your vet will be able to make a quick diagnosis and offer effective treatment. Should your Cocker Spaniel come into contact with, or swallow any plant material that may be poisonous, be sure you know what to do in an emergency. It could help to save his life!